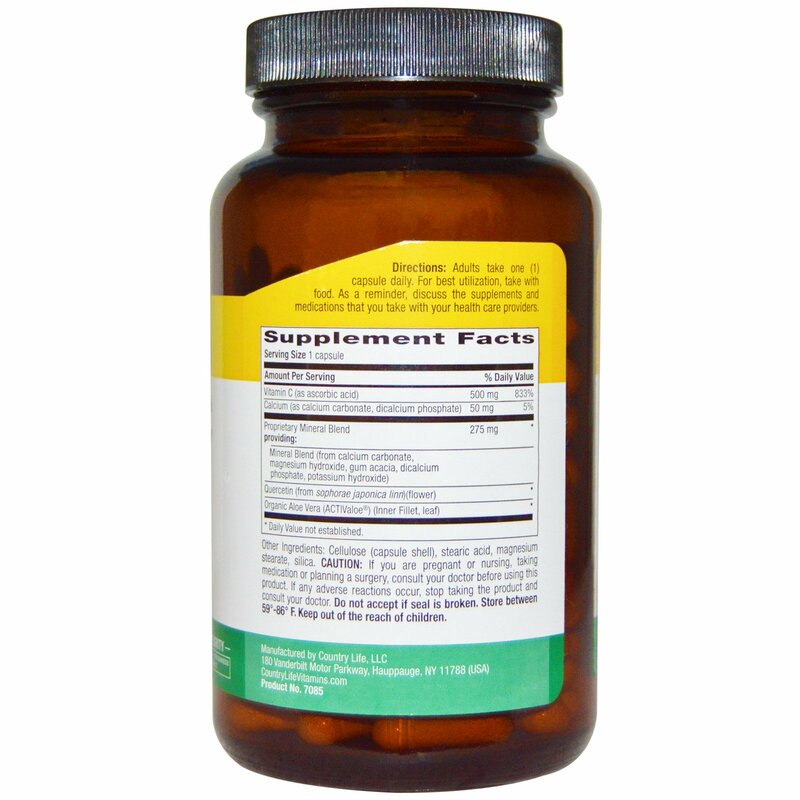 Vitamin C is a powerful antioxidant that supports immune health. 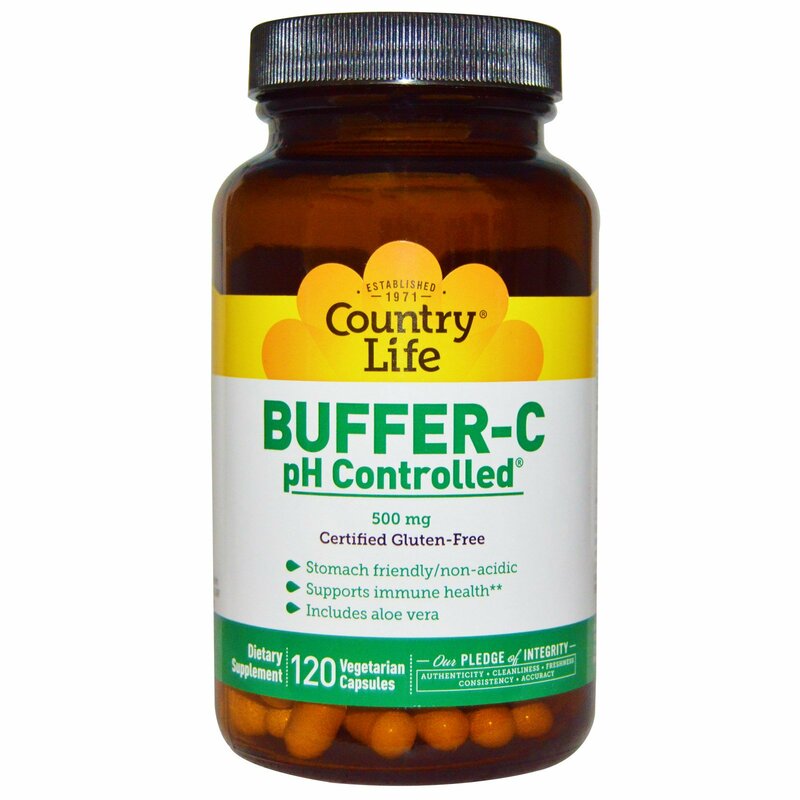 Country Life's Buffer-C pH Controlled has been prepared with a mineral blend of natural alkaline calcium carbonate and magnesium oxide which buffer the excess acidity of the Vitamin C. Also with aloe vera to support utilization. Adults take one (1) capsule daily. For best utilization, take with food. As a reminder, discuss the supplements and medications that you take with your health care providers. Cellulose (capsule shell), stearic acid, magnesium stearate, silica. Yes: Certified gluten-free by GFCO.Org, Certified vegetarian by the AVA, Recyclable packaging, Manufacturing supports wind power, Kosher-parve. No: Yeast, wheat or soy, Milk, salt or preservatives, Artificial colors, flavors or sweeteners. Caution: If you are pregnant or nursing, taking medication or planning a surgery, consult your doctor before using this product. If any adverse reactions occur, stop taking the product and consult your doctor. Do not accept if seal is broken. Store between 59º-86º F. Keep out of the reach of children.